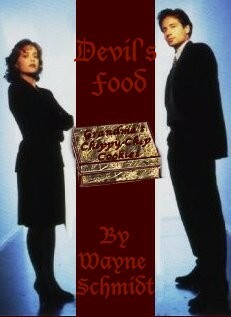 DEVIL'S FOOD: A humorous X-Files short story where Scully and Mulder investigate the cause of riots in malls around the DC area. Note: The character Ben was introduced in Mirrors. Saturday, June 17, 4:13 P.M.
John Sinclair clenched his fists as he stood half hidden behind the pillar, waiting. He watched the line of people that started at one of the malls tiny pushcart stands and trailed away down one of the mall's avenues and out of sight. Many in the line shuffled impatiently. Five people back from the front of the line, Agnes Moorelock turned her short tubby body to look at the rear of the line at the same moment the people in front of her took a step forward. The man behind the pillar grinned and strode forward into the gap. Agnes turned back, frowning at the sudden appearance of a stranger in front of her and stabbed a fingernail lacquered hot pink into his back. "What do you think youre doing?" Sinclair twisted his unshaven face around and leered down at her. "Just be quiet, lady, and we wont have any trouble." He held up a small gold-foil covered carton. "Im getting another box before they run out and no ones going to stop me." "Why, you-" she smashed the heel of her shoe onto the arch of his right foot. Howling, he bent over to grab the injured foot. She grabbed a double handful of his unkempt brown hair, thrust down and slammed his face into her raised knee. His nose crushed flat and he collapsed on the floor. Agnes gave her lime-green tank top a straightening tug, stepped over him and hurried forward. The four people in front of her had all purchased gold boxes similar to Sinclair's and had quickly disappeared into quiet alcoves. Pieces of gold foil flew up and out of each alcove. Agnes stepped up to the pushcart, her hands shaking as she pulled a fistful of crumpled money from her purse. "I'll take two." An elderly man in gray slacks and white shirt smiled at her from under a pair of bushy white eyebrows. He handed over two glittering boxes. "That'll be ten dollars, maam." She thrust a twenty at him, grabbed the boxes and scuttled away. The line flowed around the still-writhing Sinclair without notice. A bone-thin skeleton of a man with a hungry light burning deep in his eyes handed the old man a credit card. "Give me all you have left." The old man raised his hands, palms up. "Im very sorry, sir, but I just sold the last two boxes." The corners of his mouth trembled as he offered an apologetic smile. Then he stepped back quickly, putting the cart between him and the people in line. The thin mans shoulders hung. "Gone?" Then he remembered the woman whod taken the last two boxes. His lips drew tight. "Where is she?" The man next in line stared. "Where is who?" "Theyre all gone. Gone! That woman in the green top took the last two. Where is she?" Shocked expressions rippled down the line as each person in turn mouthed the word gone. One by one, they joined the thin mans cry, "Where is she?" Their voices grew until their screams echoed down the mall. Halfway down the line, a frail woman pointed a wrinkled finger at the space between two close-set columns. A glint of gold flashed in the shadows between them. "There she is!" The crowd froze in silence, then surged forward. "Get her!" As the mob rushed toward the columns, the old man quietly closed the sides of the cart and pushed it down the mall in the opposite direction. Saturday, June 24, 3:37 P.M. Experience had taught Samuel Morrison to avoid the usual hiding places: the malls dark corners, the phone banks, and especially the long passage leading to the restrooms. Hed been caught in there last month and the crowd had taken his entire box. Hed found it an hour later, ripped flat, not even a crumb remaining. He shuddered at the memory. Hed developed his own approach: instead of hiding he mixed with a crowd that didnt know about the treasure, as he was doing now. He hunkered his short spare body down behind a gondola filled with childrens books in the back of a Waldenbook store and pretended to look for a particular title. Out in the mall, voices rose in angry protest. The brittle crash of a plastic chair being smashed hushed the crowd momentarily, then their voices cried out in riotous abandon. Morrison didnt hear the growing turmoil. He slid narrowed eyes side to side, then closed them as tears of anticipation formed in their corners. He slipped a shaking hand into the gold-foil covered box. Scully and Mulder pushed through the door to the waiting room to Skinners office. The receptionist looked up with a relieved smiled. "Good, you're here. AD Skinner wanted to see you as soon as you arrived. Go right in." Mulder turned away without a word and hurried through the door. Scully followed, almost catching the door in her face as it swung closed from his passing. She pushed through and stepped up next to Mulder in front of Skinners dark mahogany desk. Assistant Director Walter Skinner was balding, wore wire-framed glasses, and had a pair of shoulders that would have looked at home on a grizzly. He stood up, towering over her and topping Mulders six-foot frame by inches. His voice rolled out, low and heavy with the burden of too many secrets. "There have been a series of riots in shopping malls across three neighboring states: Delaware, Maryland, and Virginia. The bureau has been ordered to support local authorities whenever we have available personnel." His eyes tightened on Mulder. "To the best of my knowledge, youre not currently working on any official cases." Mulder tried a half smile. "Nothing official, but-"
Skinners eyes cooled. Scully nudged Mulders ankle with her foot and his expression went straight. "No, sir," he said. "Were available." Skinner extended a blue-jacketed file folder toward Scully. She took it. "Any specific instructions, sir?" He eyed Mulder. "Try to keep out of the headlines." "We always try, sir," Mulder said. "But when the truth-"
"Truth be hanged, Agent Mulder." Skinner caught himself. "Just clear this up quietly... for a change." "Come on, Mulder," Scully said. "Lets get to work." She led the way out of the office. Mulder snatched the file from her and began reading as he sailed through the outer office. She caught up to him in the hall. "Riots have broken out in seven malls over the last two months," he said. "The most recent were in Staunton and Hagerstown." A chill prickled the back of her neck. "Hagerstown? The Riverside Mall?" His brow wrinkled. "What about it? "I was there on Sunday." He turned back a page, reread a passage and smiled up at her. "Too bad. You missed the excitement by a day. The riot hit late Saturday." "I thought the mall looked a little roughed up. How bad was it?" "Not very. Thirty people did a lot of pushing and shoving but nothing worse than that. A couple of chairs got smashed. He looked at her and grinned. "So, why were you there? Was Fredricks of Hollywood having a sale?" She crossed her arms. "Shoes, if you must know." Mulder looked down at the plain navy-blue pumps that matched her suit. "Not those-"
His smile went sly. "-practical yet curiously attractive shoes?" She set her jaw. "No. A pair of satin heels." "New Shoes? That usually means Ben's coming to town." She took the file from him. "We better get started on this." He smiled at the sudden change of subject and swept an arm toward the elevator. "After you." Scully stormed off, her heels striking sparks from the floor. Four floors down in the Bureaus basement, Mulder fell into the leather chair behind his desk and propped his feet up on an open drawer. He twiddled a yellow pencil across his upper lip as he gazed at the ceiling. Scully settled herself behind a computer terminal and brought it on-line. She tapped keys with mechanical precision, studied the screen, and tapped again. Dry bearings in an out-of-date printer squealed. A piece of paper fell into a tray. Scully examined it, then returned to working the keys. After repeating this process three times she leaned back with her arms crossed tight. "Nothing." Mulder tipped his head toward her. The pencil hed balanced on his upper lip slipped off, clattered to the floor and rolled toward her. "What where you looking for?" She bent to pick it up and tossed it onto his desk. "Any pattern that fits an X-File profile. First, I plotted the riot locations on a map to see if they followed a pattern." She tossed him a printout. "No pentagons or crop circle shapes, if that's what you mean." Mulder picked it up and rotated it, examining the map from several angles. "Kind of looks like the letter M." His eyes showed over the top of the sheet, their corners crinkling with amusement. "Think someones calling me?" "It also looks like a W and the Greek letter sigma, depending on how you hold the sheet. I dont think it has anything to do with you." Mulder dropped the paper into a trash can. "Probably right. What next?" "I tried linking the dates to any astronomical event: sunspots, meteor showers, and phases of the moon. Finally, I compared the dates of the riots to a data base of dates significant to various cults." Mulder leaned forward, his eyes bright with mischief. "I get excited when you talk like that." She gave him a look of pained indulgence. "Relax. There were no correlations." He smirked, then nodded at the computer. "Try street fairs." "Youre not the only one who goes shopping. I was at the Mayfair Mall in Baltimore last Saturday-"
Mulder held up a hand. "Sorry, no riots. But, there was a sort of indoor street fair going on. Lots of small stands and carts with retired people trying to sell trinkets and things. It made getting around a pain in the-"
"I dont see the connection." "These mall fairs are held on Saturdays to make the most of the busiest day of the week. Most of the venders belong to one of several consortiums that follow a regular tour schedule. See if you can get your magic box to tell us if the same consortium serviced the malls on the days they had riots." Scully turned to the computer while Mulder went back to balancing the pencil on his lip. "You were right, Mulder," she said. "A company called Northern Atlantic Marketing was the coordinator at the seven riot locations." Mulder jerked out of his slouch. "See which venders attended all the locations." Scullys slender fingers flew over the keyboard. She leaned back, letting the computer use the algorithm shed entered to search the FBIs data banks. The screen cleared, then displayed a "search complete" message. The printer grabbed a piece of paper and began to squeal. Mulder marched over to the terminal, his eyes bright. "What did it say?" Scully scanned the contents of the paper then handed it to him. "Only three venders were at all the riot sites." Mulder pinched his chin with three fingers as he read. "Marys Designer Tops, Grandmas Chippy-Chip Cookies, and Georges Solid Wood Creations." He dropped back into his chair. "None of them sound particularly threatening." Scully handed him a second sheet. "That's the itinerary for the next four fairs. I suggest we attend this Saturdays in Rosedale and if another riot occurs find out which of these venders is the cause." Mulder nodded vaguely. "Sounds like a plan. Ill pick you up around nine." Scully pushed herself up. "So tell me, what were you shopping for?" She raised an eyebrow at him. "The Baltimore mall has a Fredricks too, doesnt it?" Mulders eyes came back into focus and he gave her a playful smile. "Scully, you know I have more class than that. I always use Victorias Secret." He pulled a drawer open. "Want to see what I got? It just might fit you-"
She hastily backed out of the office. "Thank you, no. Im late for an autopsy." Mulder sent a barrage of chicken cluckings after her as she hurried away. Sully looked up and down the long straight concourse. It was crowded with milling people watching as venders spread pastel pink and green bead necklaces, white tee shirts printed with images of Albert Einstein, hand-sewn moo-moos, leather belts fitted with enormous silver belts, and dozens of other wares out onto low tables. The variety and quantity of offerings blurred together making her feel like she was trapped in a maelstrom of colors and shapes. Far down the mall on her left, a kettle band began clanging out a Caribbean beat on metal drums. The mall's air conditioning wafted sizzling sounds and meaty smells toward her from the right. Mulder nudged her elbow. "I smell Polish sausages. Want one?" She shuddered. "Do you know what they put into those things?" "No and I dont want to. Mystery adds spice to life." He hurried off in the direction of the cooking noises. Scully shook her head and stepped into an empty spot between two displays. The venders had set up a double row of tables running down the middle of the mall. Sellers occupied the center zone between the tables while prospective customers roamed the area between the tables and the malls permanent stores. She scanned both lengths of the mall... not a riot in sight. Mulder stepped beside her. He had a foot-long sausage jammed into a regular-sized bun. Both ends of the sausage stuck out, shiny with grease. He bit one end off, careful to hold his meal well away from his faded blue jeans. "I doubt a little grease is going to hurt them," she said. "They look ten years old." Mulder licked juice off his lips. "I bought them pre-faded. A stain would ruin the used-but-clean effect." Scully glanced down at her dark blue suit. "I wish you had mentioned that you were dressing undercover. This outfit makes me stand out." "No one will notice in this crowd." His voice dropped. "Did you spot anything?" Scully inclined her head in the direction of the Caribbean music. "Marys Designer Tops and Georges Solid Wood Creations are five tables down in that direction. They set up next to each other and spend a lot of time talking. I assume they're friends." Mulder nodded. "Probably tour together. I passed Grandmas Chippy-Chip Cookies down in the food court area. Its a pushcart instead of a table. Seems to be selling a lot of cookies." Scully examined the venders. Most of them sat behind their tables knitting, eating, or reading paperback books. People walking by spent a lot of time looking and touching but not buying anything. "Many of the venders appear to be retirement age." "Its better than sitting at home watching television." Mulder swallowed the last of his hot dog and took a quick look around. He held his voice low. "I dont see anything likely to cause a riot." Scully cocked an eyebrow at a rack of brilliant orange tee shirts tie-dyed with purple sunbursts. "Im not so sure about that." Mulder followed her stare and chuckled. "Im off to do some surveillance." Her eyes went round. "Seconds already?" "Dessert. Plus, I want a closer look at Grandmas stand." He merged with the crowd. Scully shouldered her way down the mall in the opposite direction to where she could watch Mary and George market their wares. Scully assumed that the heavy-set gray-haired woman in beige slacks and purple blouse was Mary. She spent a lot of time arranging and rearranging a collection of yellow, pink, and blue knit blouses with appliqued pictures of Raggedy Ann dolls. People fingered the material, grimaced at the appliques and moved on. George was having better luck. He was gray and wiry thin with the strong leathered hands of a wood worker. The table in front of him was crowded with exquisitely detailed trucks made from contrasting woods, similarly constructed trains, and an array of complicated rubber band guns. One model was a machine gun that fired fifty rubber bands as fast as the user could crank a handle set into its side. George handed one to a boy and let him bury his younger sister in a barrage of flying rubber. There was an immediate rush toward the table and George sold five guns in as many minutes. The sales trickled off and the crowd attracted by the demonstration dissipated. Scully stepped up to the table. "How much are the machine guns?" George beamed a toothy grin at her. "Forty dollars, little lady." Scully balked. He held the empty one hed used in the demonstration out to her. "Best-made gun of its type youll ever find, and it comes with a box of top-grade rubber bands." She took the gun and ran her fingers over its cool white pine surface, sanded satiny smooth. The cylinder spun silently as she gave the crank a turn. Scully smiled. Maybe Ill use it on Ben next time we get together. She dug her pocket book out of her purse, careful not to let anyone see the chromed nine-millimeter automatic laying next to it. She handed him two twenties. George slipped a freshly loaded gun into a white bag, followed it with a small box of pink rubber bands, and held it out to her. He smiled and winked as she took it from him. "This model's spring loaded. All you have to do is squeeze the trigger." He ran his eyes down her. Jacobson backed up. "Sorry. I like to size up my customers." He pointed at the bag in her hand. "For your boyfriend?" She nodded, but the smile didn't warm. "How did you guess?" "Youre young, attractive, and dont have a wedding ring." Scully glanced at her ring finger. "Youre very observant. Ever think of joining the FBI and becoming an agent?" He laughed and slapped a narrow thigh. "Thats a good one. Why, I never met an FBI agent once in my entire life." The smile crept closer to her eyes. "Youd be surprised. Theyre more common than youd expect." She drifted back to her hiding place just as Mulder sidled up beside her. He had a small brown cardboard box tucked under his arm and was munching something. Scully tapped the box with a fingernail. "Grandmas cookies?" "Grandpa would be more accurate. An old guy did all the selling. I guess Mas back in a kitchen somewhere making more." He flipped the lid open for her to see. "Chocolate chip, and not bad either. Try one." Mulder shook the box at her. "Come on, Scully. Go wild for a change... try a cookie." Scully shook her head resignedly and broke a small piece off a cookie the diameter of a saucer and took a bite. It had a delicately crunchy outer shell surrounding a chewy, moist interior heavy with chocolate chips and nuts. It was still warm. Her eyes went wide. "Told you," Mulder said. "He nukes them in a microwave to warm them up." Mulder tossed the empty box into a trash bin. "Whats in the bag?" She swallowed, savoring the creamy smoothness of the warm chocolate. "Something for Ben." Mulder looked around with exaggerated interest. "Really? And not a Fredricks in sight." "You need some new material." She stepped closer to him. "Anything happening?" "The same. I guess we wait." Mulder nodded and they began a slow drift toward the music. A country group had replaced the steel drums. As they passed, Mulder dropped a dollar in an open guitar case in front of the group and gave the female lead a smile. She bowed back and started into the next set. Scully and Mulder made three orbits of the mall, walked the outside perimeter, had a late lunch in a Red Robin restaurant, and made one final circuit of the concourse. Nothing had happened and the crowds were starting to thin. "Looks like a bust," Mulder said. "I say we call it quits." Scully looked down the mall. Venders were starting to pack up, stuffing clothes and other offerings back into the same boxes they had been dragged out of nine hours earlier. "We might as well. The traffics going to be a nightmare as it is." Scully and Mulder exited the mall, giving the sparse crowd one last look before pushing through the heavy glass exit doors and heading for their car. They hurried across the parking lot, shivering as a cold north wind ruffled their hair. Five minutes later they were on Highway 95 heading south. Ten minutes after that, the Rosedale mall exploded in a riot. Scully marched into the office, her heels clacking impatiently, the white bag in her hand rustling with each stride. Mulder crouched on the floor, his face inches from the gray glow of a television monitor. "You heard?" she asked. He nodded without turning away from the monitor. "Caught it on the news Saturday night. We missed it by minutes." The phone on Mulders desk erupted with strident ringing. He ignored it. Scully moved to pick up the receiver. "Dont," Mulder said. "Its probably Skinner wanting to lecture us on leaving a stakeout too early. Well do a lot better to avoid him until we have a solution to this case." She stepped over to the monitor. It showed a black-and-white image from a birds eye view of a mall. People walked around in short jerky steps as if it were a cartoon framed too slowly. She recognized some of the tables running down the middle of the concourse. "Surveillance tapes from Rosedale?" "Maybe. This segment was taken half an hour before the riot hit." He placed a finger on the screen, marking a shadowed area behind a support pillar. "See the man hiding there?" Scully bent and squinted. "Barely. Why is it important?" "According to the VCRs timer hes been standing there for twenty minutes." Mulder hit the fast forward button. People began scurrying around as if they were enraged ants. The man in the shadows shuffled from foot to foot, but stayed hidden. Then in a blur of motion, he disappeared. Scully blinked. "Where did he go?" Mulder rewound the tape and played it back. At normal speed she watched the man suddenly jerk to attention and run diagonally off the screen. Mulder glanced up at her. "Ten minutes later the riot broke out." "Does he show up on any of the other tapes?" Mulder bobbed his head. "As it happens, yes. Wait until you see this." He switched tapes. The screen filled with a similar birds eye view of the food court. Mulder indicated a pushcart in the upper right corner of the screen. "Thats Grandmas Cookies. Watch." Activity around the cart was sparse. The scene dragged on for five minutes with no one making a purchase. The old man at the cart scanned the crowd, sighed, and then began pulling cookie boxes out from a storage cabinet under the cart and stacking them on the selling shelf. As he lifted one of the boxes, its side caught the light and flashed. Before hed finished, a dozen men and women had crowded around the stand and more were piling up behind them. Scully watched as he traded boxes for cash as fast as his hands could move. No one waited around for his or her change and business was so brisk that the old man didnt have time to chase after them. The pile of boxes quickly dwindled to nothing. The old man held up his hands helplessly to the people left in line and began closing up the cart. One man pushed another, the pushed man fell into third, knocking him over and suddenly fists were flying. Mulder keyed the pause button. "It looks like we know what ignites the riots." "Who, anyway," Scully said. "We still dont know whats inside those boxes. Mulder smiled. "Cookies. We had some, remember?" She gave him a sideways look. "They werent that good." "Maybe not, but theres one more thing I want you to see." Mulder rewound the tape and started it playing. He paused it right after the old man started moving boxes. A man-sized blur was moving into view from the edge of the screen. "Thats our friend from the first tape. He was hiding and waiting for this exact moment to move in. And look here, and here." Mulders index finger tapped several hiding places near the edge of the screen. Each one showed someone hurrying out of the shadows and toward the cart. Mulder snapped the monitor off and stood up. "It looks like Grandma's Chippy Chip Cookies has a dedicated following." "What happened to Grandpa?" Scully asked. "Slipped away in the confusion." Mulder sauntered over to his desk and fell into the chair. "I contacted Northern Atlantic first thing this morning. Grandpas real name is Alfred Jacobson. His wife, Wilma, is Grandma. They work out of their house in Rockview. Al travels and sells the cookies Wilma bakes. Atlantic says theyve never been any trouble and are one of the few venders that always turns a profit. Grandpas scheduled to be at Carsons Mall in Columbia this Saturday. I think we should be there." Scully nodded. "Im taking Thursday and Friday off but Ill be back by Saturday." Mulder leaned forward and gave her a half leer. "Ben? In the middle of the week?" She shrugged. "His sisters visiting and he wanted to introduce me." "Meeting the family, eh? Sounds serious." She lifted her chin a fraction of an inch. "Its already serious, this is making it official. But Im taking something that I hope will lighten things up." Mulder eyebrows went up. "Oh?" She held up the bag for him. "Something I purchased in the mall." Mulder half stood, staring at the bag. "What's it?" She thought about showing it to him as she had planned, then reconsidered. Mulder's early-morning sarcasm was something she decided she could do without. Scully about-faced and headed for the door. "Nothing important. I have an inquest review that will take me the rest of the morning. I'll check back with you later." He chased her with chicken noises again. She stopped, pivoting slowly to face him. "Mulder, I really don't feel like...."
He threw three more squawks at her. Scully regarded him a moment, then walked stiffly back into the office and set the white sack down on top of the television monitor. Smiling victoriously, Mulder lounged back in his chair. Scully put her hand into the bag. "You're sure you want to see what it is?" "Let me have it, Scully," he smirked. "I can take it." Mulders mouth dropped as she lifted the rubber band gun from the bag. He jerked up, but before he could protest Scully pulled the trigger. The cylinder on top of the handle spun, filling the room with a whirring sound as it released a shower of florescent pink rubber bands in Mulders direction. He froze as the cloud of rings descended on him. The cylinder slowed to a stop. Mulder stood in shocked attention, pink rubber bands covered the front of his white shirt and blue tie. Three were tangled in his hair and one looped over his left ear. Scully raised an eyebrow. "I guess it works." Mulder blinked at her several times. "Scully, I can't believe youd-"
The office door closed with an ominous snick and Scully and Mulder turned toward the sound. Assistant director Skinner glared back at them, his lips barely moving as he spoke. "Im glad to see you had a good reason for not answering my call." "Sir," Scully began. "I can explain." Skinner's eyes darted from the wooden gun in her hand to the rubber bands covering Mulder. "Do so, in writing." He forced a calming breath. "Tell me you have a handle on this riot situation." Mulder snatched the rubber band off his ear. "Yes, sir. I believe we know who is instigating it and will apprehend him next Saturday." "The case against him will be stronger if hes taken with incriminating evidence in hand." Skinners jaw worked as he regarded the rubber bands still clinging to Mulders shirt, then he nodded once and stormed out of the office, slamming the door hard enough to shake dust out of the ceilings acoustic tiles. Scully began easing toward the door. "Sorry, Mulder. Ill take care of the report on this... incident." Mulder brushed rubber bands off his shirt. The bright pink rings fell on the floor and desk, bouncing in every direction. His eyes leveled on her. "You know, of course, Ill have to get you for this." "Whats that?" Scully asked, pointing at the small box in Mulders hand. Mulder shook it; cookie crumbs rattled inside. "I picked up a box of Grandmas finest during my last walk-around. I figured that just because Im about to bust him, it doesnt mean I cant enjoy his product." He dumped the empty box into a trash bin and slapped crumbs off his dark suit coat. Scully scanned the half-hidden corners on the food courts perimeter. Each held someone sulking in the shadows. "It looks like everyones ready to repeat last week's performance." "Including us," Mulder agreed. "Only this time were going to get in on the ground floor." Scully stretched up. Whered Grandpa go?" Mulder easily looked over the crowds heads toward the cart. "Hes bending over to get something under the cart." Scully surveyed the mall. It was smaller than Rosedale and the number of venders was down accordingly. No band music filled the air but somewhere the sound of a lone guitar injected a hint of festiveness into the atmosphere. She felt Mulder move away. "Scully, Im making the circuit one more time. Back in five." She nodded him off and went back to watching the cart and the people in the shadows. "Caught you napping!" Mulder said from behind her. Scully flinched, then willed herself to relax. "Hows the mall?" He strained to take a huge bite out of a chocolate chip cookie and talked around the mouthful. "Very quiet." He handed her a gold foil covered box. "I picked up one last batch of cookies. I thought-"
"Mulder! The people in the hiding places are moving." He swallowed the cookie and grabbed the last from the box before hurrying off. "Ill cover the far side. Give me a ten-count then move in." Mulder disappeared into the milling crowd. Scully started counting as she shuffled sideways to throw Mulders box away, and froze. Scully stared at it, eyes wide, turned it over in her hands, caught the yellow gleam off its golden surface... golden... gold! She jerked her head up toward the opposite side of the mall. "Mulder!" A rising clamor of angry voices drowned her out. People began shoving each other on Mulders side of the food court. She heard a meaty thud as someone landed a punch. Scully tried pushing through the mob but heavy bodies plowed into her, knocking her left, right, backwards. The riot approached a deafening crescendo when an ear-splitting detonation echoed down the mall, rattling glass storefronts and freezing rioters in mid motion. A sudden hush engulfed the scene and the mob drew back, opening a circular clearing on the far side of the court. Mulder stood in the middle of the opening, his nine-millimeter automatic held high, its chromed surface glinting in his hand. "Heres the deal," he yelled in a voice steeled in determination. "I get all the cookies and no one gets hurt." "Mulder!" Scully screamed. "Put your weapon away!" Uncertainty flashed across his face and the gun came halfway down. The mob surged forward and Mulder vanished under a hail of fists. Scully applied a sterile dressing to a cut on Mulders forehead. He groaned and opened his eyes. She gave him a wry smile. "If you feel as bad as you look, you have my sympathies." Mulder tried to return the smile, then winced as the attempt stretched open a cut in his lip. "What happened?" He massaged the back of his neck. "Yeah. Sort of. I remember-" his eyes popped open. "-firing a round off?" Scully smiled. "Youre going to have to write a very creative firearm-discharge report to justify it." He looked around, grimacing at the white walls, white cabinets filled with white-labeled bottles, and the white terrycloth blanket pulled up to his chest. Scully indicated the room with a nod. "This is Columbia Hospital. I pulled you out of the riot and drove you back hear to clean up your wounds. They may sting but theres nothing serious." He closed his eyes. "It was the cookies, right? Something in them, some kind of drug." She handed him a yard-long sheet of graph paper with a confusion of alpha-numeric codes running across its lower border and a jagged line that cut across the length of the chart. In three places the line spiked upward off the top of the chart and then dove down an inch farther on. Mulder squinted at it. "What is this?" "A gas chromatograph of the cookie crumbs in the box you gave me. These peaks," she pointed at the spots where the plot went off scale, "correspond to three general classes of drugs: The first shows similarities to oncologic appetite stimulants, the middle to the sympathicomimetics  they effect the central nervous system - and the last one to thyroid extracts. All of them profoundly effect appetite." Mulder eased himself to a sitting position and began testing his arms and legs. "Nothing broken, I take it." Scully shook her head. "A couple of close calls but no, youre in one piece." "Why didnt it hit me right away? I ate a whole box and-"
She handed him the gold-foiled box. "The second box was different. I realized something had changed when a floodlight reflected off its surface. The same thing happened in the security video right before the Rosedale riot broke out. Jacobson sells the plain boxed cookies first then the gold boxes later on. He must use box colors to keep them separate. The cookies in the gold boxes are laced with something that compels people to do anything to get more. He must have made a fortune." He crumpled the box and hurled it at a trashcan. His eyes narrowed. "If this stuff is so addicting, why don't I feel the need for more cookies right now?" She picked up the lump of glittering cardboard and quietly dropped it in the can. "Whatever is in those cookies is not addicting. The compulsion is only strong while the agent is active in the system. That's why the riots never started until after Jacobson started selling them. Until people had eaten the laced cookies, the compulsion to get more wasn't strong enough to drive them into a frenzy. From observing you I would estimate the average period of aggressive-compulsive behavior is two hours. That means that whatever it is, it's not fat soluble." Scully noticed the look. "If it were fat soluble, it would stay in the system longer. Water-soluble compounds are more quickly assimilated and eliminated." Mulder nodded. "Does this drug have a name?" "Its not a single drug but several working in concert. The number and complexity of compounds suggests that its derived from a natural source." "You mean this stuff grows on trees?" "Bushes more likely. I think its a herb." Mulder lowered himself off the clinics bed to his feet. His shirt was torn at the right shoulder and small dark brown flecks of blood were scattered across his white collar. He ran fingers through his hair and stiffly pulled on his suit coat. Scully stood back and waited. He managed three steps before his knees buckled. She caught him halfway down. "You were knocked unconscious, Mulder. Theres no indication of a concussion but you better take it easy until morning." He braced his hands on his knees and managed to push himself up. Scully helped him stagger back to the bed. "You win for now, doc," he said through pale lips. "But first thing in the morning Im personally going to throw Jacobson in a cell." Scully grimaced as Mulder pounded his fist against the doorframe of the yellow split-level house, rattling the screen door from the force of the impacts. She pivoted on her heel to take in the neighborhood. The clapboarded house they stood by was centered on a cul-de-sac filled with similar neat houses and green manicured yards. The air was cool and pungent with acrid smoke. Mulder started to bang on the door again but halted when the inner door squeaked open. From halfway down, a pair of spectacled eyes peered up at him. "Yes?" a tremulous womans voice asked. Mulder held out his identification. "Im Special Agent Mulder and this is my partner, Special Agent Dana Scully." Scully smiled formally and nodded at her. "Maam," Mulder said. "We need to-"
"Weve been expecting you." She pushed the screen open. "Please come in. We wont cause any trouble." Scully regarded the woman. Wrinkles and white hair placed her in the late seventies. She was shorter than Scully and slightly stooped. An equally old man stepped up beside her. Scully recognized him as Jacobson. Mulder led the way into a bright living room filled with overstuffed furniture covered in floral patterns. "Mr. and Mrs. Jacobson?" Mulder asked. The couple nodded in unison. "I regret to inform you that Agent Scully and myself are here on official business. It has come to our attention that you may have been trafficking in an illegal substance. Furthermore-"
Scully reached out and touched his elbow. "Actually," she whispered. "Thats not the case. The analysis doesnt fit the profile of any known drug so we cant claim its on the FDAs prohibited list." Mulder gave her a pained looked, then turned back to the Jacobsons. "Regardless, the fact is that you have been selling something that may have caused nine riots, many serious injuries, and significant property damage. Were going to have to take you in." Jacobson pointed an age-gnarled finger toward the corner of the room. Scully turned and saw two small suitcases covered in faded plaid cloth. The old man dropped his arm. "Were all packed and ready to go. We werent sure if wed be allowed our own things in jail but we decided to be prepared, just in case." He offered his wife an arm and they started toward the door. Mulder stood rooted to the middle of the room, blinking. Scully stepped in front of the old couple. "Theres not that much hurry. Before leaving we need to ask you some questions." Jacobson pursed his lips. "You want to know what we put in the cookies." The old man sighed. "Come this way." He headed towards a door in the rear of the room. Scully and Mulder followed him through a white-tiled kitchen with light green cupboards. She inhaled the rich aromas of vanilla and cinnamon, baked into the walls from decades of cooking. Scully followed the men through a door opening onto a acre-sized yard defined by a white picket fence and filled with shrubs of every size and shape. Jacobson led them on a narrow trail winding through the tangle of shoulder-high vegetation to a small clearing. A circular area charred black marked its center. The sharp aroma of smoke was strong. "Thats it, "Jacobson said, regret weighing down his voice. He swept the rest of the garden with an arm. "Ive collected two-hundred and seventy-four herbaceous specimens from all over the northeast but this," he indicated the burnt spot, "was my favorite. Never saw anything like it in the wild or any arboretum. It had light and dark green variegated leaves and delicate pink flowers that lasted all summer long. Insects didnt bother it and it wasnt picky about soil. I came across it last year in the Allegheny National Forest. Shouldnt have taken it but I couldnt resist." He shook his head. "Never broke a law in my life before that. I suppose thats why everything went wrong." "You used it in the cookies?" Scully asked. The old man nodded. "The flowers smelled like vanilla. Wilma was making some cookies and ran out of the real stuff so I suggested chopping up some of the flowers and using them. Worked real good, too. Seemed to give the cookies an extra little kick. She baked up a larger batch and added them to the stock we were planning to sell at a fair the next day. The regular cookies sold pretty good, they always do, but as soon as people got a taste of these, they came back and bought our entire stock. I figured wed discovered a winner." "Then the riots started?" Mulder asked. Jacobsons shoulders hung. "Three weeks later we were at the Galleria Mall in Portsmouth and I noticed several people hanging around the cart but not buying any cookies. Then I put the special ones out," he looked up at him. "I saved them until Id sold as many of the plain cookies as I thought I could." "The special cookies were in gold boxes?" Scully asked. "Right" Jacobson said. "The second I put the special ones out the people who had been waiting rushed and practically mobbed the cart. I sold every box I had but they still wanted more. A fight broke out and the place turned into a bedlam. I got out of there in the all confusion. Fortunately, everyone seemed more interested in getting their hands on the boxes other people had bought than they did in me." Mulder stared down at Jacobson. "Once you knew the danger, why did you continue selling the cookies?" The old man looked away. "We needed the money for medical expenses." "Wilma and I have thyroid problems. Its treatable but the medication is expensive. If youre on a fixed income...." He shrugged. "Thyroid medication." Scully said nodding. Mulders brows came together and she turned to him. "Their medication probably interfered with the drug from the plant. Thats why they didnt experience the same compulsion to eat the cookies as you did." "So that was it," Jacobson said. "I never could understood what all the excitement was about. Anyway, yesterday someone used a gun in the mall." Mulder looked away. The old man went on. "I knew then that what we were doing was too dangerous. This morning I burned the plant to the ground." Scully felt a churning in her middle. She recognized it as the signal her subconscious sent her when it was time to bend the rules. "Mulder, I need to talk to you." Mulder studied her face. "Mr. Jacobson, would you give us a minute?" The old man nodded and trudged back toward the house. "We cant do this, Mulder," Scully said. "At their ages the strain of the trial might kill them. If that didnt, prison would... if you got a conviction." Mulder threw his arms out wide. "What do you mean if. They confessed." Scully shook her head. "The only thing the Jacobsons are guilty of is trying a new herb in a recipe. Thousands of people do that every day. Its not a crime. The fact that they ate the cookies themselves proves they thought they were safe. Any defense attorney worth his salary would get the case thrown out of court." "Until its proven to be dangerous it would have to be classed as a food additive. FDA guidelines in that area are so vague that the case would be hopeless. I'll address these issues in our report to Skinner. Considering the Bureau's current case overload, he'll accept our recommendation to not prosecute them." She rested a hand on his arm. "This is a good one to walk away from." Mulder stared down at the burnt remains of the plant. "Yeah. Okay." They headed back to the house. Jacobson gave Wilma a hug that threatened to crack her ribs. She shoved him away playfully. "Al! Youll crush the breath out of me." He put his arms around her again, gently this time. "We were lucky. If those agents hadnt understood...."
"Youre right." Her shoulders fell. "Still, what are we going to do for money?" His smile remained bright. "I dont know. Sell the house, maybe. At least were free to work the problem." "Speaking of work," she said pushing him away again. "You need to clean up the burnt area where the plant was. The smells not going away and I dont want that nosey Sandra Clamden next door complaining. You better go turn the soil over or something." "Right," Jacobson said. Might as well get the area ready to plant something else." He wandered off through the rear door, mumbling to himself. "Wonder what I should put in there?" Wilma busied herself in the kitchen. She was halfway through rearranging the dishes in the cupboards when the rear-door burst open. Jacobson staggered in, lugging a yard-long root the color and shape of a giant rutabaga. The roots top was charred black. "Albert Jacobson," Wilma cried, her eyes wide at the sight of the dirt hed dragged into the kitchen. "What in the world do you think youre doing?" He dropped the root to the floor. The impact shook the house. "Its the root from the plant," he said breathlessly. A mischievous look spread across his face. "Think you can do something with it?" Wilma Jacobson smiled and reached for a vegetable peeler. The sound of her door opening made Scully look up from a medical examiners report. Mulder stepped halfway in. "Sorry I grumbled so much about letting the Jacobsons off the hook on the ride home. I can see now that you were right." Mulder nodded. "Yes. By way of an apology Id like you to have this." He leaned into the room to place a small gift-wrapped box on the corner of her desk, then jumped back as if it were a bomb about to go off. She prodded it with the end of a pencil. It didnt explode so she picked it up and began unwrapping. "Thanks, Mulder. This really wasnt necessary." She began lifting the top off. Mulder took a step backward. "Oh, I think it is." Scully looked into the box. All it held was a small piece of folded paper laying on a bed of florescent pink rubber bands. She took the paper and unfolded it. Mulders grin grew to heroic proportions. Confusion played across Scullys features. "I dont understand." Her phone rang. Mulder looked at his watch. "If the advertisements for the Postal Departments promise of on-the-hour delivery for the new Premier-Delivery service can be believed, that should be Ben calling to thank you for the gift belonging to that receipt. She picked up the phone. "Scully speaking. Ben? Yes?" She shot to her feet. "You got what! No, Ben. I would never-"
Mulder stepped backward. "Paybacks a pain, isnt it," he said as he pulled the door closed. Scully felt red heat rushing up her face. "Mulder! You get back here and explain this! Mulder!" Disclaimer: X-Files is the property of Fox Television and Chris Carter. Only the story elements particular to Devil's Food are the property of the author and may not be used without his permission.